Children took part in a “moving” ceremony to mark the opening of their new high school. St Andrews the Apostle, in Oakleigh Road South, which started lessons in September, is the UK first Greek Orthodox State School. 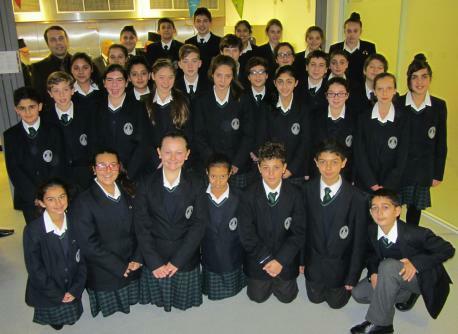 Teachers and pupils celebrated their school with a special service of thanksgiving on Friday, lead by the head of the UK’s Greek Orthodox Church, Archbishop Gregorios. They gave a presentation about the life and work of the school’s patron saint and three year seven students lead everyone in a prayer of St Andrew. This was followed by the school choir’s first public performance, including a hymn sung in Latin. His Eminence, Archbishop Gregorios, expressed his gratitude to everyone who had helped to make the school happen. The school plaque was unveiled by the Archbishop and Chipping Barnet MP, Teresa Villiers. Chair of the governing body, Yiannis Pareas, said: “The staff are the most amazing collection of dynamic and dedicated people one could ever wish to be associated with. “The things which are impossible with men are possible with God.” He thanked all the parents for their trust and support in the organisation of the school. Parent Kyrie Michaelides said: “I was very impressed with the students’ outstanding performance – they were so confident and mature. It’s these extra qualities that I wanted for my son at school.